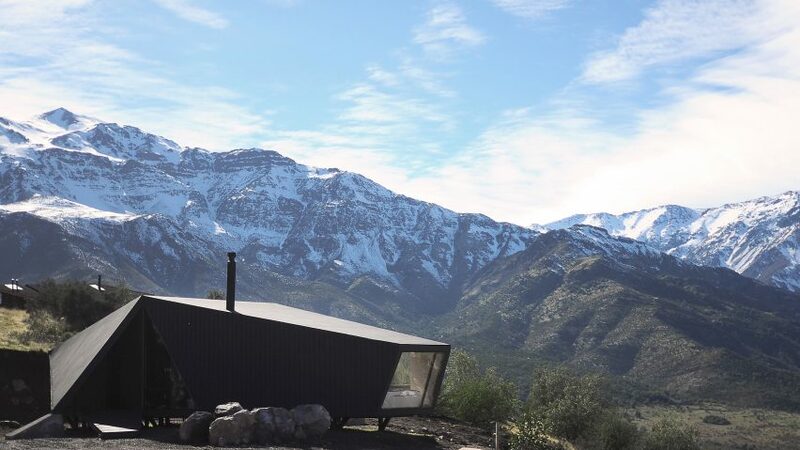 Chilean architect Gonzalo Iturriaga used folded planes of blackened pine to create this faceted cabin as a retreat for a mountaineer in Chile's Valparaíso Region. 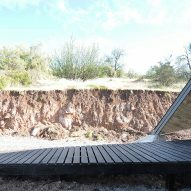 Iturriaga designed the retreat for a rocky site near the city of San Esteban, using piles to give the irregularly shaped structure an even footing. The 60-square-metre cabin is named in RF C9, and has a basic suite of rooms consisting of two bedrooms, a bathroom and a large living room. It is designed to offer a simple space where its mountaineer owner can rest. An irregularly pitched roof and sides that slope inwards give the structure its faceted form. One triangular plane folds down from the roof to shade a stretch of decking that extends out from the lounge. "The proposal consists in constructing, through planes and angles, a cover that allows the entrance in its folds and the exterior views in its cuts," explained the architect. "Composed of a central corp of services, the form is established from folds that correlatively determine its interior and exterior." "Using a ventilated facade on all sides and a system of piles, the shelter functions as a hermetic element suspended on the ground which, from specific openings, uses the rising current of the mountain to ventilate its interior," he added. While the timber has been blackened across the exterior, inside the surfaces are left untreated. They are contrasted by black window frames, light fittings and a wood-burning stove. 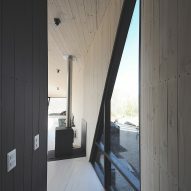 Furniture made from the same light-coloured pine is built into the walls, which are punctured by windows in an assortment of shapes. A large combined living room and kitchen sits alongside an equipment store at one end of the residence, with bedrooms at the other. Slovenian architects OFIS Arhitekti have designed two other refuges for climbers, including a tiny aluminium-clad cabin that cantilevers over the edge of a mountain and another concrete-clad refuge they designed with Harvard students. Photography is by Gonzalo Iturriaga.